Joseph Ratzinger-become-pope wants to forget Vatican II. His Rome wants to reform the reform and pretend Vatican II never existed. The Church is the People of God — a community of men and women united in faith. The male-dominated clerical superstructre is simply an administrative body. It exists to be of service to the People of God and not to dominate and control through intimidation, denigration, and condemnation. Humanity and the human condition progress through time. Cultural understandings and the ways in which we think and express ourselves change. The signs of the times deserve in depth reflection and concrete action rooted in that reflection. Yesterday’s understanding of the human condition is not necessarily today’s and will probabaly not be tomorrow’s. Church teaching, like all theology, is time-bound. Yesterday’s expressions are not necessarily best suited to today’s understandings and language. Healthy theology dares to ask questions and dares to formulate answers that echo the tradition and resonate with the experiences of contemporary believers. Today’s ecclesiastical leadership has willfully imprisoned itself in a nineteenth century time warp. 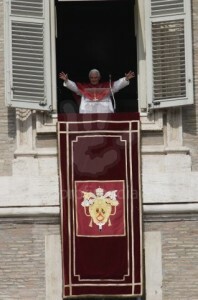 Pope John XXIII smiled at the world and opened the windows. Pope Benedict turns up his nose, slams the windows shut and nails them closed with ornate medieval nails. How do we speak today about our experiences of the Divine? Who is God for contemporary believers? Two thousand years after he walked the earth, who is Jesus of Nazareth, raised from the dead, whom we proclaim Lord and Christ? And what does it mean to be a human person? And how do we develop and live a system of values that respects that humanity in all its cultural, historic, religious, ethnic, sexual and gender varieties. PS………..How did the Pope celebrate the anniversary of Vatican II? I am president of a conference of the St. Vincent de Paul SOciety in my paarish. I am a EUcharistic Minister, taking Communion to the sick; I am a lector; I instruct altar servers; I teach Sixth grade Parish REligious Instruction every Wednesday evening; I attend daily Mass and have been doing so on and off since I was seven years old; I have been on the Parish Council several times; I helped erect a statue of the Little Flower on our parish grounds; I help support the Catholic school in our parish. I am a retired public school teacher. I am 82 yeaars old. I studied to be a Jesuit priest for twelve years but left for personal reasons, with a dispensation I love my church. I am quite familiar with the teachings of Vatican II. I am neither liberal nor conservative, but an ordinary Catholic. I knew a couple of the priests who abused boys. THey are dead now. Are you building up the CHurch or trying to pull it down? Be honest. And someone should remind you that he is the Vicar of Christ. The accoutrements of religion are not self-glory aimed at the person of the Pope; rather, such display shows the importance of the office. 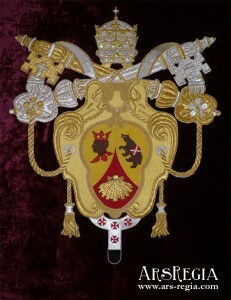 The tiara simply represents the threefold duties of the papacy: universal pastor, universal ecclesiastical jurisdiction, and temporal power (as the head of Vatican State). Rather than concentrating on designing new decorations for his balcony, he should have been drawing up a list of Bishops to be retired ASAP for their moral cowardice, lack of truly pastoral leadership and failure to recognize evil despite decades of theological training, as evidenced by their coverup of sexual abusers!! 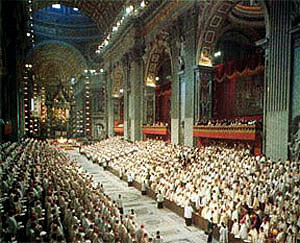 Vatican II should never have happened. I hope Benedict XVI becomes the oldest pope in history. He is slowly returning the Church to her rightful glory—despite the wreckovators of the pro-Vat II crowd. I am 61, converted to Catholicism when I was 12—out of a rural, anti-Catholic state—in the days of the glorious Latin Mass, nuns in habits, meatless Fridays, and weekly confession, and always before Communion. I, too, entered the seminary, but left just after the “changes” were being implemented. Forty years later, it is more than evident that all the experimentation was based on lies being told by the bishops and priests. None of it should have ever happened. If your idea of religion is what followed Vatican II, then join a protestant sect. Greg, you can still have the glorious Latin Mass, meatless Fridays, and weekly confession, and always before Communion if you want. It is just that one size does not fit all and people with other preferences should also be served. After all, none of the things you mention were commanded by Jesus as obligations for us all.